I am pleased to address this important forum which has a significant potential to contribute to uplifting the Sri Lankan economy. Over the years, a lack of economic stability has been a major hindrance to doing business in Sri Lanka. As a result, economic growth in the post war years has been dominated by debt financed state investments. Such a model is unsustainable. With a growing debt stock the Government finds it difficult to balance public investment and debt servicing. It is in this context that our Government has shifted to a private sector, export, and FDI, led model of economic growth. The State will play a key role in smart regulation, setting a robust institutional framework, and targeted interventions to ensure social justice and equity. Economic stability is a sine qua non for a private enterprise-led growth model. The Government was able to introduce several key reforms towards ensuring long-term economic stabilisation. In 2017 Sri Lanka achieved a primary budget surplus for the first time in many decades. The Inland Revenue Act came into force on 1 April 2018, with the aim of simplifying and rationalising the tax regime. This legislation creates a transparent and predictable tax regime, shifting away from ad hoc tax changes that hinder investment. Our objective is to establish a level playing field which will encourage competition and contestation which would be of benefit to consumers and a competitive economy. In addition to the fiscal policy reforms, the Central Bank has been successful in bringing down inflation to 1.6% in April 2018, reserves reached a record high of $ 9.5 billion, and credit growth has been managed to a sustainable level. All of these developments have set the stage for a take-off in economic activity and growth. A crucial element of the investment decision is ensuring a competitive business climate. Ensuring smooth processes in starting up and expanding a business has been a major policy objective of this Government. As mentioned earlier, the Inland Revenue Act has simplified the processes pertaining to taxation. The business registration process was streamlined and Register of Companies (RoC) now facilitates business registration through a single website allowing company registration within a day. Several other steps are being addressed relating to ease of access to and registration of land, construction permits, and other elements relevant to the business climate. Investment-related incentives have also been reformed with open ended tax holidays being replaced by targeted capital allowances which directly reward the investment in capital. Accordingly, a company investing more than $ 3 million in depreciable assets gets a capital allowance of 100% on top of the regular depreciation schedule. For investments over $ 100 million the capital allowance is 150%. There are also benefits for investment in R&D and the IT sector, and for investments in the Northern Province. Strategic sectors such as exports, tourism, and IT are taxed at a concessional corporate tax rate of 14%. This transparent and attractive investment incentive package is expected to create a strong stimulus for future investments into Sri Lanka. Sri Lanka is in the process of implementing comprehensive unilateral trade liberalisation. This includes the rationalisation of para-tariffs which add costs to business and consumers. In addition to unilateral trade reforms, the Government is in the process of entering into strategic trade agreements with key regional economies. We recently signed our very first comprehensive FTA with the Singapore and two other comprehensive FTAs are being negotiated with China, India, and other ASEAN nations. Along with GSP + Sri Lanka will soon have market access to India, China, and Europe, making the country a unique destination for investment. This network of FTAs will enable Sri Lanka to meaningful integrate into regional value chains to drive future trade and economic growth. Improvements to business climate through digitisation of key processes such as land registry and integrating Government agency approvals. It is clear that macroeconomic conditions have stabilised, setting the stage for investment and economic growth. The Government is committed to further facilitation of the investment climate through a well-thought-out program for eliminating barriers in the business environment. A clear set of comprehensive investment incentives have also been spelled out. 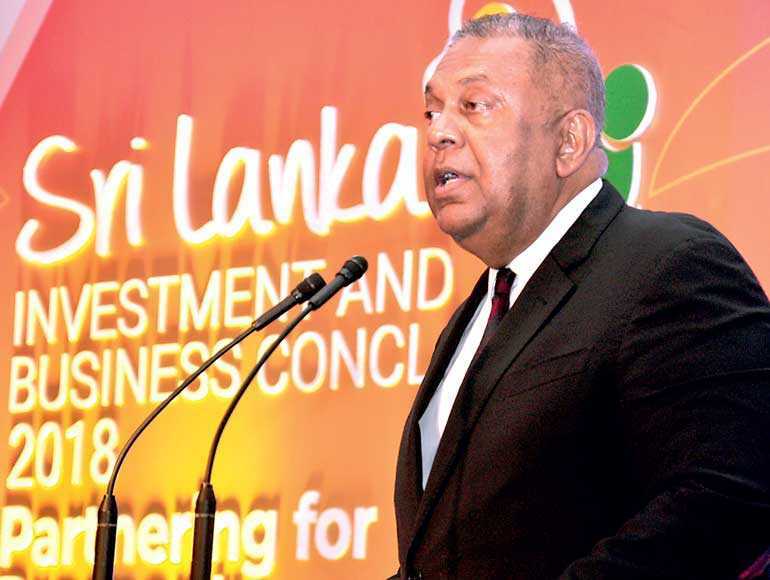 Sri Lanka is poised to be a major source of investment for companies looking to use Sri Lanka as a base to tap into the fast growing Indian Ocean region. I trust you will grab this opportunity with both hands – and we will support you all the way. I wish the deliberations all success!